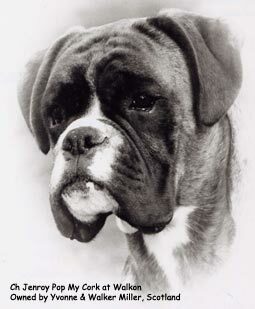 GENERAL APPEARANCE : The Boxer is a medium sized, smooth coated, sturdy dog of compact square build and strong bone. His muscles are taut, strongly developed and moulded in appearance. His movement is lively, powerful with noble bearing. The Boxer must be neither cumbersome or heavy, nor light or lacking in body substance. BEHAVIOUR / TEMPERAMENT : The Boxer should be fearless self-confident, calm and equable. Temperament is of the utmost importance and requires careful attention. Devotion and loyalty towards his master and his entire household, his watchfulness and self-assured courage as a defender are famous. He is harmless with his family but distrustful of strangers. Happy and friendly in play, yet fearless in a serious situation. Easy to train on account of his willingness to obey, his pluck and courage, natural keenness and scent capability. Undemanding and clean, he is just as agreeable and appreciated in the family circle as he is as a guard, companion and working dog. His character is trustworthy, with no guile or cunning, even in old age. Jaws/Teeth : The lower jaw exceeds the upper jaw and is slightly curved upwards. 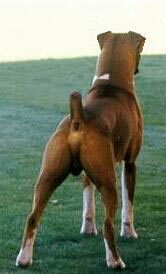 The Boxer is undershot. The upper jaw is broad where it joins the cranial region, tapering only slightly towards the front. The teeth are strong and healthy. 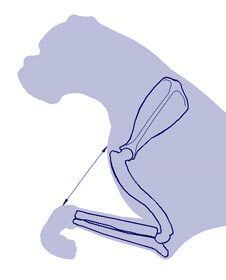 The incisors are as even as possible, set in a straight line. 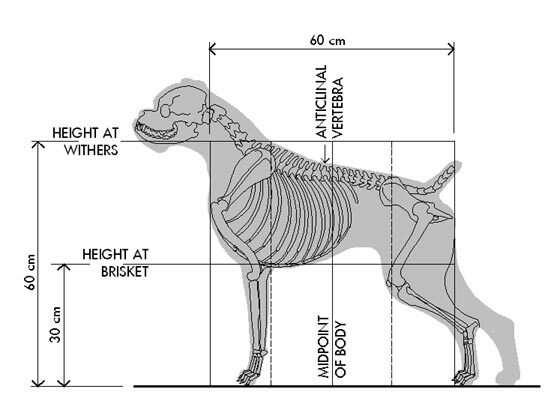 Canines wide apart and of good size. Chest : Deep, reaching to elbows. Depth of chest is half the height at withers. Well formed forechest. Ribs well sprung but not barrel-shaped, extending well to the rear. TAIL : Set on high rather than low, customarily docked and carried high. Behaviour / Temperament : Aggressive, vicious, cunning, untrustworthy, lack of spirit, overly shy. Head : Lack of nobility and typical expression, sombre face, Pinscher or Bulldog type head. Dribbling, showing of teeth or tongue. Muzzle too pointed or slight. Bridge of nose falling away. Leather or weather nose, pale nose leather. So called, "hawk eye", lack of pigment in haw. Neck : Short, thick and throaty. Body : Front too broad and low to the ground. Sagging body, roach or sway back. Lean, long, narrow, sagging loin, loosely coupled body. Tail : Low set on, kink tail. 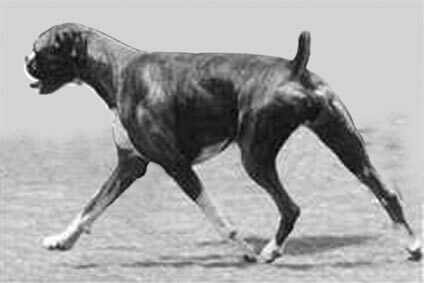 Forehand : French front, loose shoulders, loose elbows, weak pastern, hare foot, flat, splayed feet. 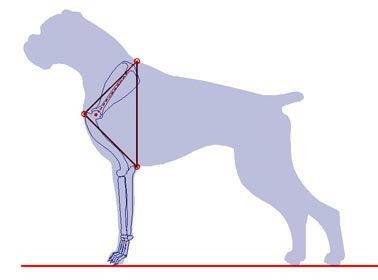 hocks, narrow hocks, dewclaws, hare foot, flat, splayed feet. Movement : Waddling, insufficient reach, pacing, stilted gait. Colour of coat : Mask extending beyond muzzle. Stripes (brindling) too close together or too sparse.